2. 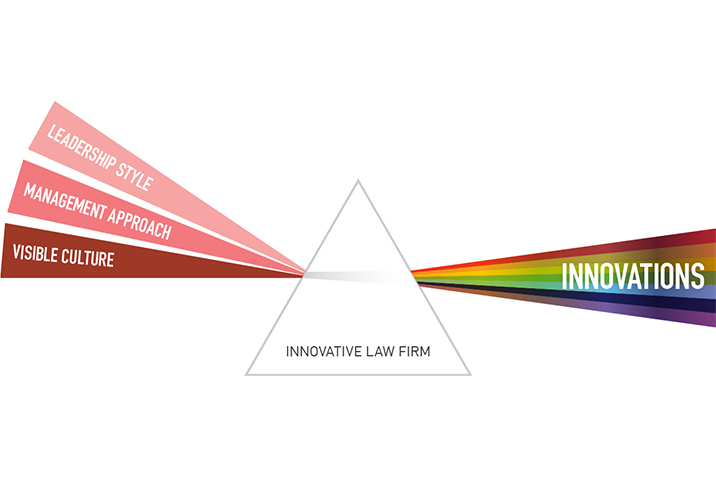 What makes a law firm innovate? We have built on the work of Edgar Schein of MIT’s Sloan School of Management, who created a widely-recognised model that helps understand and identify corporate cultures, including the artifacts (the visible displays of culture) and shared assumptions (the inherent beliefs and values). The RSG approach creates a practical framework that unpicks the relationship between leadership, management and culture in law firms. We see from our research that a firm’s ability to innovate begins with its leadership. It is astonishing the difference an individual law firm leader or general counsel can make to an organization’s desire to innovate. A strategic leader with the ability to communicate vision, who is able to skillfully use the management tools at her disposal and then tap into those cultural values that predispose the organization to create will be able to maintain the fertile soil a firm needs to innovate. However, each firm will also have a different set of management tools and cultural attributes which create their particular style of innovating. For example, transparency is a key management tool which appears to have a connection to innovation, but equally we have seen firms who utilize opacity to their advantage. Similarly, there are major firms who do not have an entrepreneurial culture but veer to a more academic legal approach. They can equally use that cultural attribute to innovate.